With a list of sailing accolades dating back for decades, including an Olympic Gold Medal, Allison Jolly is one of the sports great career success stories. She is currently in her 13th season as head coach of the University of South Florida sailing team. Allison’s competitive career includes two Intercollegiate Championship sailing titles, two U.S. Women’s Sailing Championships, runner-up in the European Women’s Championships, and the U.S. Yachtswoman of the Year designation, all before graduating from college. 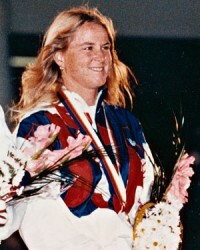 The highlight of her sailing career occurred when the International Olympic Committee announced the first-ever women’s sailing event for the 1988 Olympics. Encouraged by family and friends to campaign for the team, success came in the form of a Gold Medal in Korea with her partner in the 470 class sailboat. As coach of the sailing team at USF since 2004, Jolly has led the team to six appearances at the ICSA Women’s Singlehanded Nationals (2005, 2008, 2010, 2011, 2012, 2015) and 12 straight appearances at the ICSA Women’s Dinghy Nationals (2005 through 2016). Allison, who was hired to be the USF sailing coach in August of 2004, currently lives in St. Petersburg with her family.